As Ricardo Montalban in his famous role as Mr. Roarke used to say, SMILES everyone, SMILES!, it’s Daisy’s buddy Jason Perlow again, and you know what that means — welcome back to Boriqua Island. Sorry, no Tattoo. 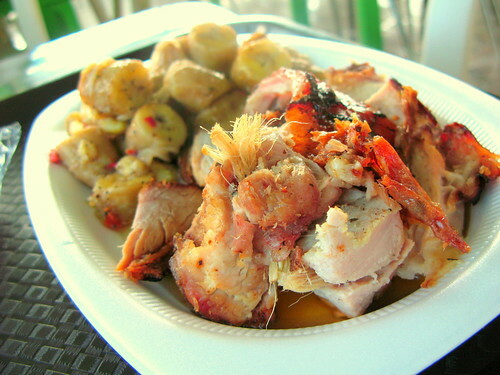 Last post, we talked about seafood and all the myriad of ways Puerto Ricans like to eat them. But I would be amiss if I didn’t talk about a very special place on the Island — a land where its Thanksgiving and Christmas 365 days a year. The place I’m talking about is GUAVATE. 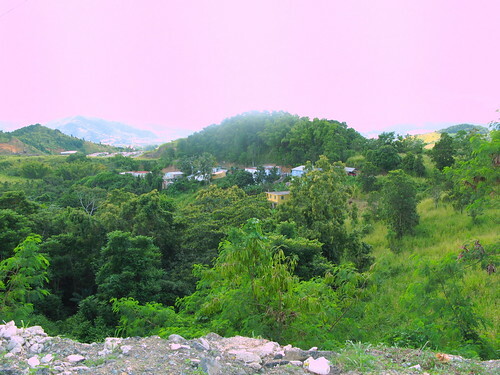 Guavate is an area that is designated as a district as part of the larger town of Cayey, which is in South-Central Puerto Rico. 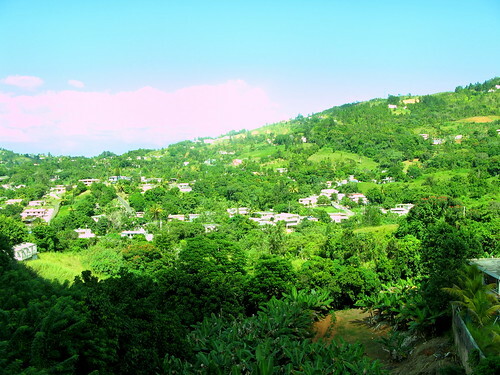 Its a mountainous, forested area that has become known over the years as a favorite recreational spot for Puerto Ricans — and as a result, has created an entire culture dedicated to eating traditional holiday foods, such as Lechon (Roast Pork) and Pavochon (Roast Turkey — see Daisy’s Recipe). 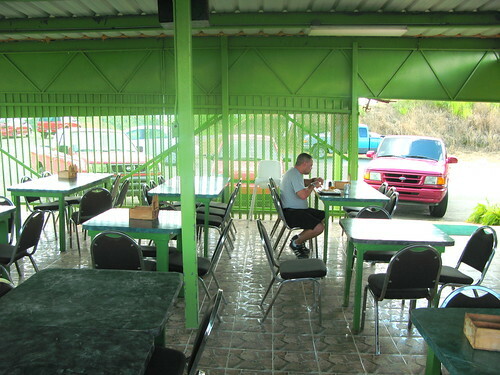 A single road which passes through the town, Highway PR-184, also known as as the “Pork Highway” has many restaurants which specialize in these two dishes and all their accompaniments. Which one is the best? It’s hard to say, but Rachel and I visted two of them and if we picked the two worst ones, then I can’t imagine what the two best taste like. Your best bet — and our overall strategy — was to see which parking lots are the busiest and have the most amount of people eating there. Click on the “Read the rest of this entry link below” for more. 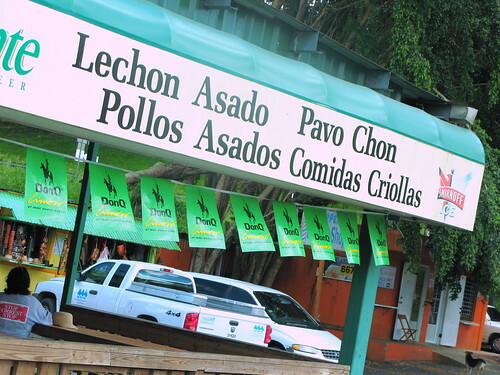 Here’s the signage from a typical Lechonera. 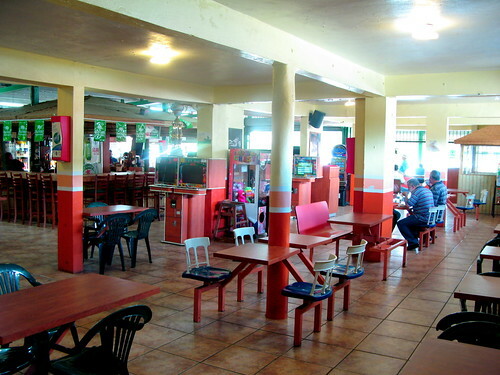 Here’s the first place we walked into, Los Amigos. 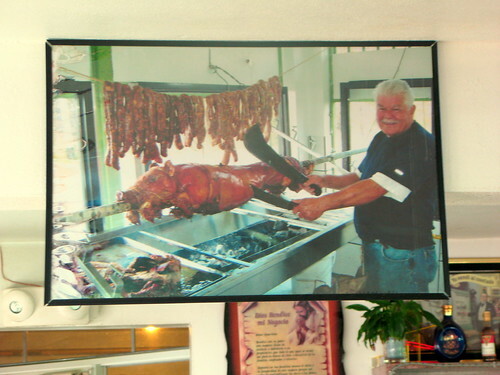 And here’s what greeted us front and center — an entire roast pig, as well as whole spits of slow roasted turkeys, rubbed with wet adobo seasoning. The insides of these places can be pretty big. The only thing I can compare this to would be Texas BBQ culture. 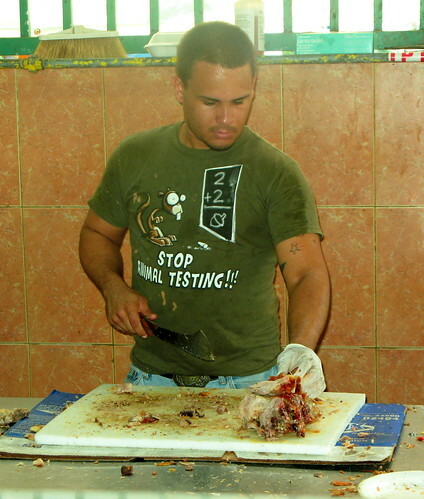 Here’s the guy that took our order and cut up the roast pork with his big cleaver. Or is that thing a machete? 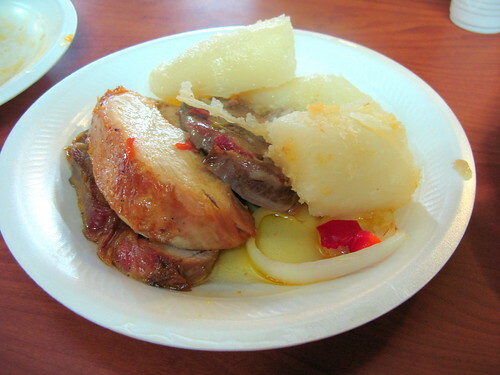 A plate of Pavochon (left) and a plate of Lechon (right) with “Aranitas”. 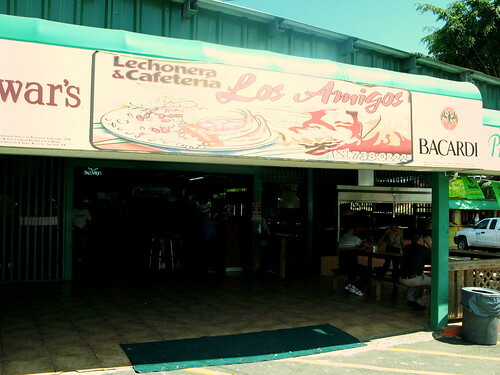 Aranitas (“Little Spiders”) are essentially latkes made out of shredded green plantain and deep fried. 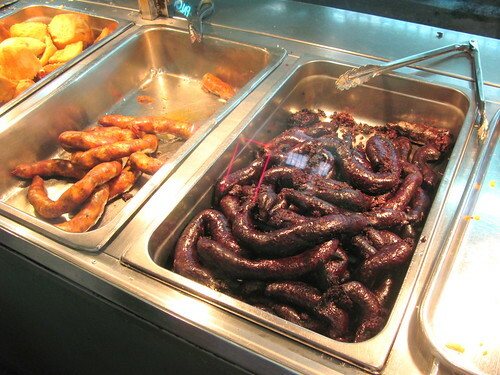 Typical side dishes at a Lechonera — Morcilla (Blood Sausage) as well as Longanitza, another kind of pork sausage. 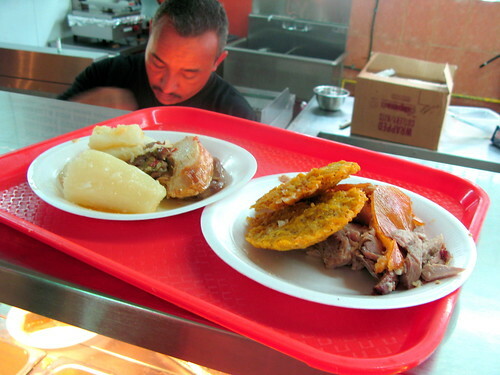 This is an order of Pasteles, which are the Puerto Rican equivalent to Tamales, except that they are made out of mashed green plantains, yuca, and pumpkin instead of masa. Daisy has an excellent recipe for these. 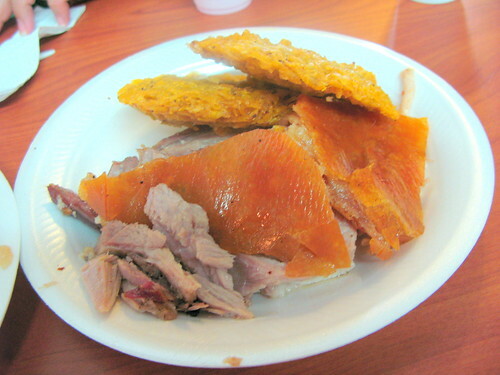 And the Lechon con Aranitas, with crack your teeth open yummy pork cracklins. 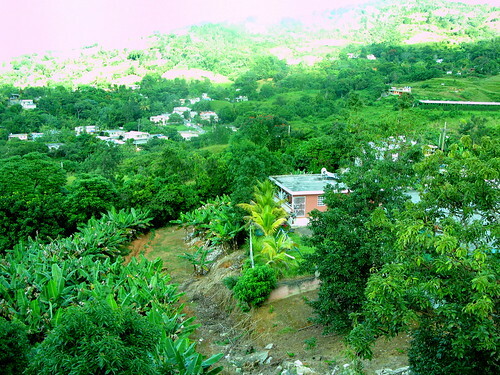 Wanting to get a more representational sampling we drove up the road and saw this place, overlooking the mountains. Here’s the view from the cliff. What a doozy! 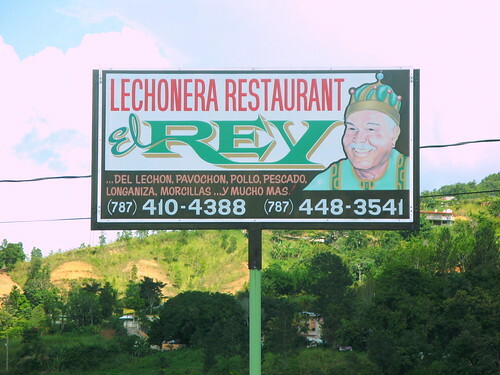 If this guy calls himself “The King” then his food MUST be good. El Rey takes a different approach to its Pavochon than in the first place — they debone and truss the entire turkey — I’m going to try and do this for Thanksgiving this year. 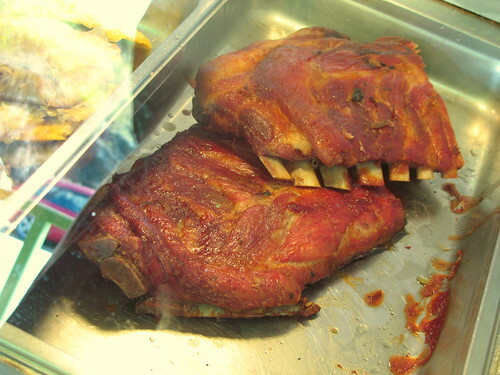 El Rey also has ribs. Again, accomodations are simple, but the food is amazing. 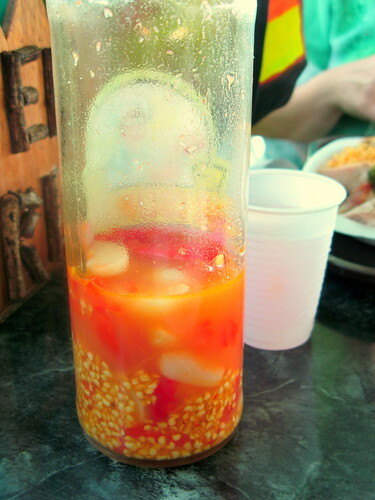 Every table comes with a bottle of this stuff — home made Aji (hot pepper) Vinagre with garlic. This stuff will put some serious hair on your chest. 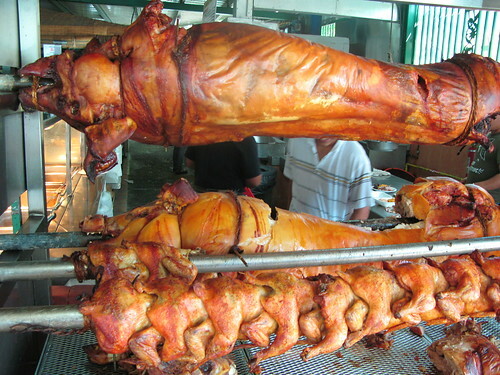 Here’s El Rey’s Lechon. We really liked this one. 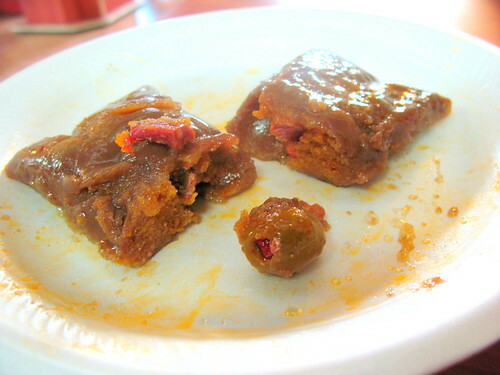 I ordered it with an Escabeche, which is a green plantains dish cooked with onions. 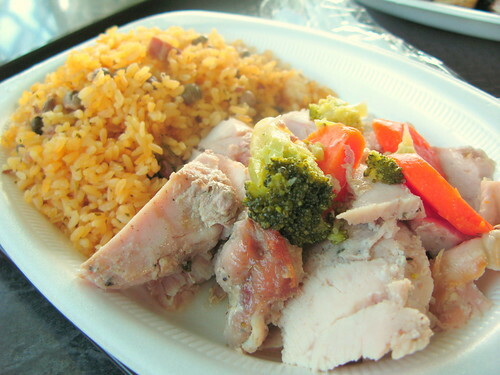 And here’s El Rey’s Pavochon, served with Arroz con Gandules (Rice with Pidgeon Peas). Thanksgiving, right? 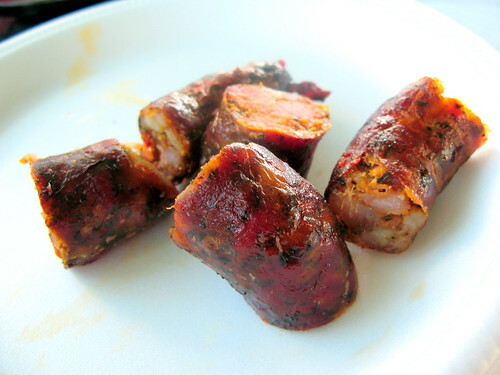 A side order of Longanitza sausage, similar in taste to a Spanish Chorizo, but spicier. 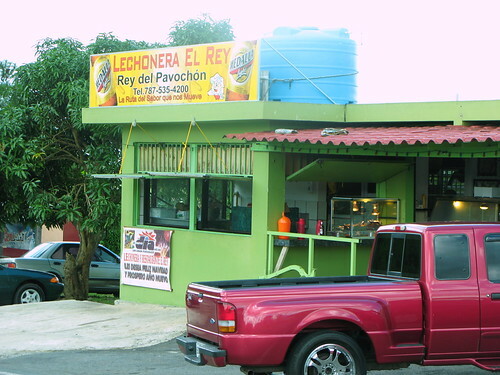 A Photo of El Rey in action. If Thanksgiving had a mythical equivalent to Santa Claus, I’d pick this guy. 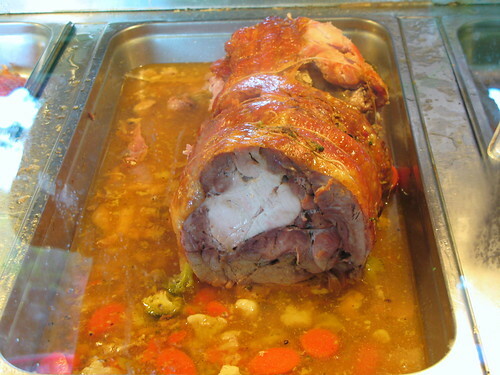 This entry was posted on Monday, November 24th, 2008 at 3:54 pm and is filed under Food. You can follow any responses to this entry through the RSS 2.0 feed. You can leave a response, or trackback from your own site.